Mickey Mouse has quite a milestone right around the corner as he reaches his 90th birthday! Disney marks Mickey’s birthday as November 18 in honor of the release of his first theatrical film, Steamboat Willie on November 18, 1928. As Walt said, “‘I only hope that we never lose sight of one thing—that it was all started by a mouse.” There are so many ways to celebrate this iconic mouse’s birthday whether you are in the parks or celebrating from your home. Here are all the Mickey Mouse birthday celebrations fans can enjoy! Ready to Plan Your Trip to Disneyland and Celebrate Mickey Mouse? If you are fortunate enough to be in one of the Disney Parks for Mickey’s 90th Birthday Celebration, there is plenty to enjoy at each Disney Park. Walt Disney World Resort will celebrate Mickey’s birthday celebration from November 16-18. They will have exclusive merchandise, food, and entertainment all to celebrate Mickey’s 90th birthday! Guests can celebrate at Magic Kingdom during the “Move It! Shake It! Dance & Play It!” Street Party, sing “Happy Birthday” along with the Dapper Dans on Main Street, U.S.A., and join in a special birthday dance party at Rockettower Plaza Stage in Tomorrowland. Mickey’s birthday celebrations will continue in 2019 when the World’s Biggest Mouse Party comes to Walt Disney World. Now that’s a birthday party that lasts! The Disneyland Resort will enjoy their Mickey Mouse celebration on November 18th which will include Mickey along with his friends alongside the Disneyland Band. The celebration cavalcade will start at “it’s a small world” and will pause in front of Sleeping Beauty’s Castle before going down Main Street, U.S.A. and concluding in Town Square. The celebration will continue in 2019 when the World’s Biggest Mouse Party comes to the Disneyland Resort. Shanghai Disney Resort has the honor of being the first resort to host the World’s Biggest Mouse Party which will give us Americans an idea of what we can expect at Walt Disney World and Disneyland in 2019. 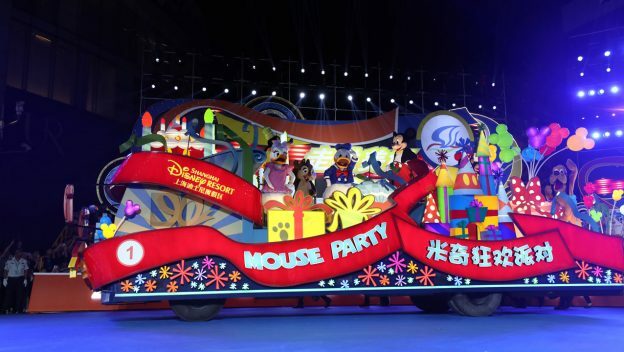 The opening ceremony of the Shanghai Tourism Festival featured a brand-new Mickey-themed float to help kick off the Shanghai launch of the World’s Biggest Mouse Party. At Shanghai Disneyland, a giant birthday card will be installed next to “Storytellers” statue, featuring birthday wishes from Mickey’s pals. From November 16-18, guests will enjoy themed food and merchandise offerings as well as the opportunity to sing “Happy Birthday” to Mickey just before the nighttime spectacular show each evening, all culminating with a special nighttime birthday spectacular at Enchanted Storybook Castle on November 18. 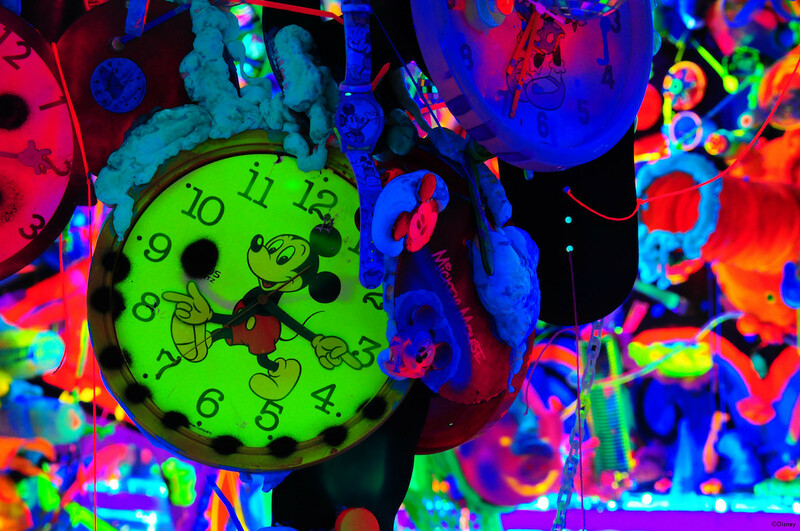 Hong Kong Disneyland will kick off it’s World’s Biggest Mouse Party on Mickey’s birthday, November 18th, with commemorative park tickets, special food and merchandise, a hotel room overlay, and “We Love Mickey” projection show that will run through February 2019. Tokyo Disney Resort joined the celebration with special decorations and merchandise. The exhibit will cover everything from Mickey Mouse’s beginning in Steamboat Willie to all of the technicolor cartoon shorts and more. Guests will be able to step into this history of Mickey Mouse and experience the 90 years of journey this iconic mouse has taken in our culture. This exhibit is sure to be amazing, we would love to hear from anyone that gets the opportunity to experience it. Comment below if you plan on visiting the exhibit! Not going to be able to visit the parks or the exhibit in New York? Don’t worry we’ve got you covered. 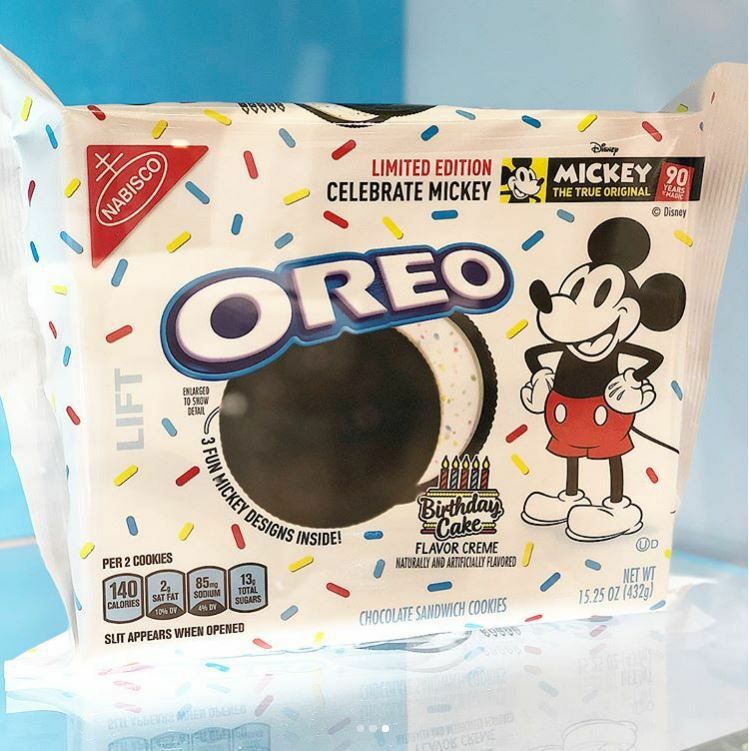 Here’s a few of the Mickey Mouse 90th Birthday Celebration food products you can buy now and enjoy at home while you watch Steamboat Willie on repeat! These are my favorite! Oreos stamped with three fun Mickey designs and birthday cake flavored creme. 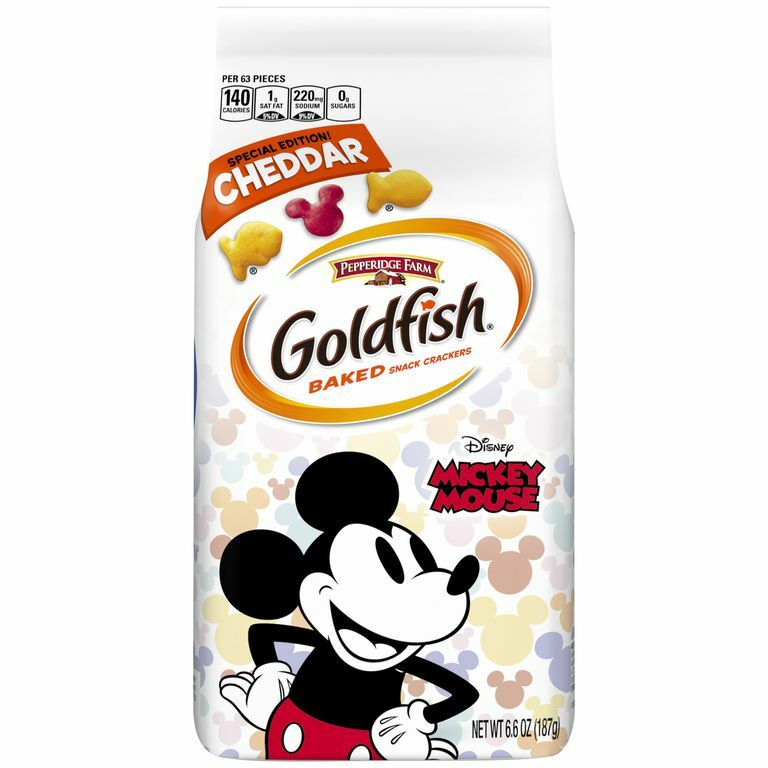 Yes, Mickey Mouse shaped Goldfish crackers! These are a kid’s dream come true- along with the young at heart. 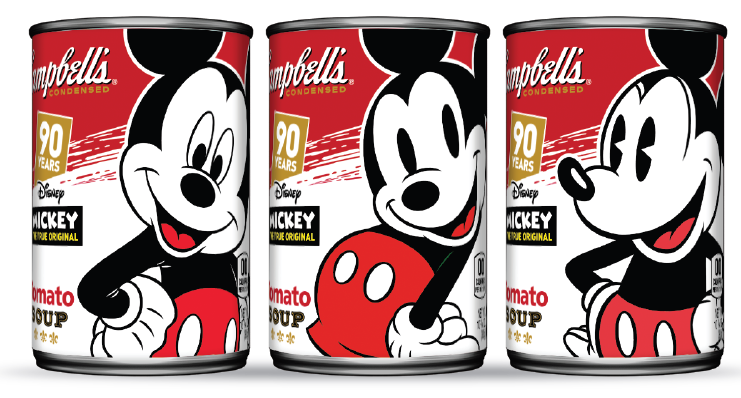 Campbell Soup is featuring three different Mickey designs from over the years so the most avid fan can collect them all. 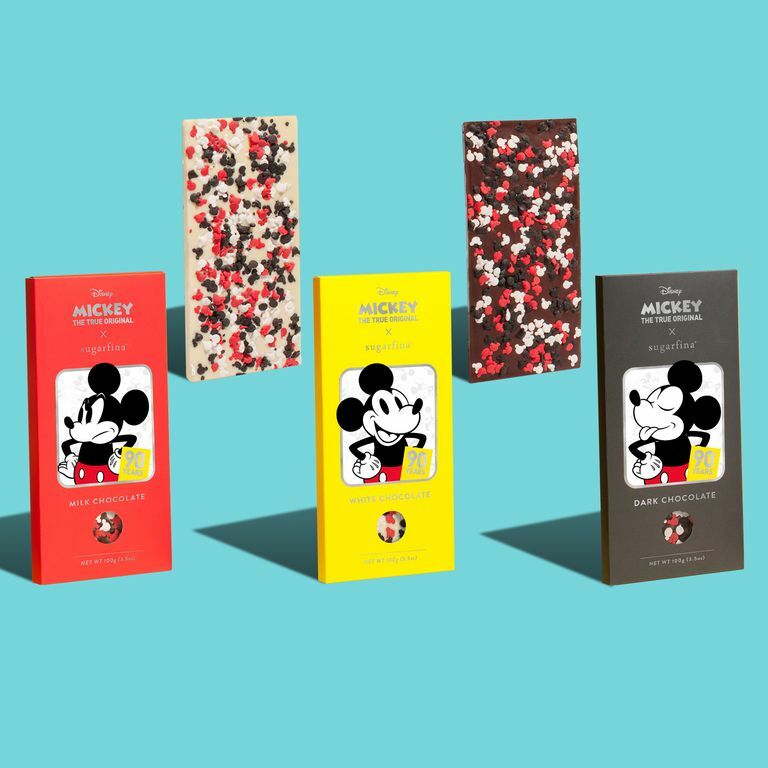 Sugarfina has released three different Mickey themed birthday bars in milk chocolate, white chocolate, and dark chocolate covered with Mickey shaped sprinkles. These were made with the Mickey fan in mind! 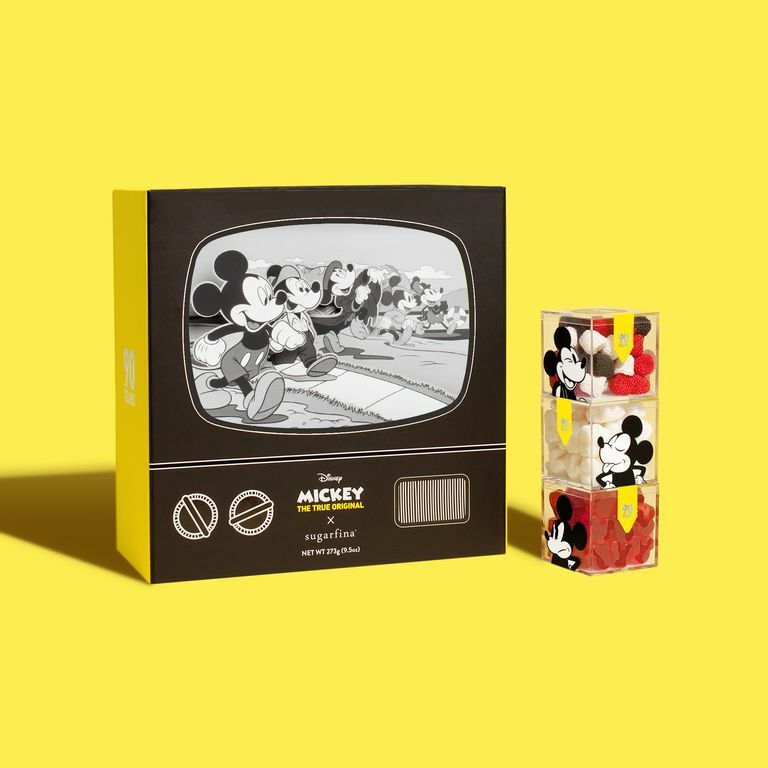 Each box is shaped like a vintage TV set with an iconic Mickey illustration and includes each of the special edition candies. And of course, you can’t go wrong with the Disney Store itself which always has plenty of Mickey Mouse themed goodies stocked and ready to be devoured. 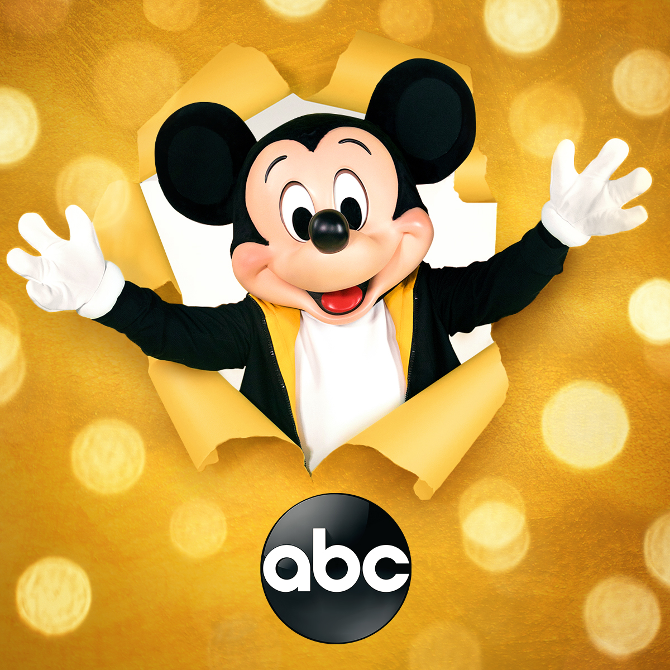 Mickey’s 90th Spectacular, a dazzling two-hour primetime event celebrating 90 years of Mickey Mouse, airs Sunday, November 4 8|7c on ABC. From the Shrine Auditorium in Los Angeles, California, the elegant affair will feature star-studded musical performances, moving tributes and never-before-seen short films. Superstars from music, film and television will join the festivities to celebrate the birthday of the internationally beloved character on Mickey’s 90th Spectacular. If you didn’t catch it, you can still watch it on the ABC app on your tablet, smartphone, or tv streaming device (Roku, Firestick, etc.) Or you can watch it ABC’s website. Thank you for the great guide Lindsay! I wish that I could get out to NYC to see the exhibit.